Rock Crystal is clear, colorless quartz valued for its clarity and colorless beauty. 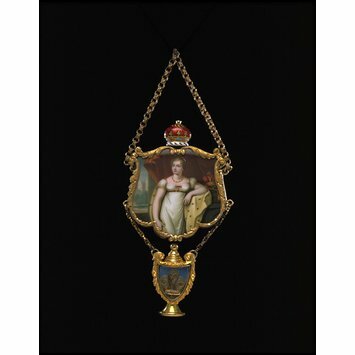 Since antiquity, is has been used extensively in jewelry, particularly before the invention of plastic and the widespread use of glass. The word ‘crystal’ comes from the Greek word ‘krystallos’ which means ‘ice’. Rock Crystal is ‘real crystal’ as opposed to ‘glass crystal’ which is also called crystal. Rock crystal is warmer to the touch than crystal cut glass and will also have a very different sounding ‘clink’ if touched to the teeth. If you have crystal glass and rock crystal side by side, it is generally easy to tell the difference. Also, rock crystal is doubly refractive whereas glass is singular. Real rock crystal is approximately four times more valuable than glass so it is important to be clear on the difference. 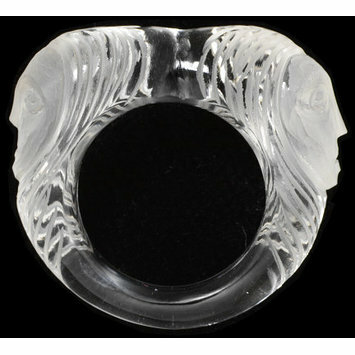 Rock Crystal can be faceted, carved or cabochon and has a wide variety of uses in jewelry. 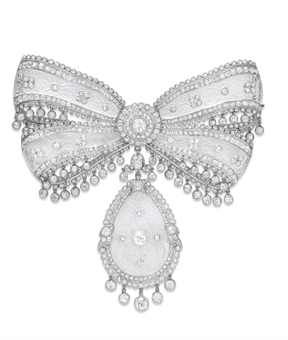 Below I have listed some of the many ways in which rock crystal has often been used in antique and period jewelry. 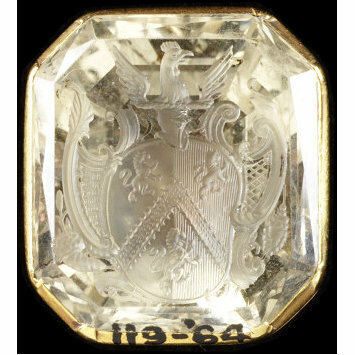 From 1650 through the Georgian era, flat topped rock crystals with faceted sides called Stuart Crystals were produced in commemoration of King Charles I. Stuart Crystals could be combined with hair-work and were used in rings, pendants, earrings, cufflinks and clasps. Carved Rock Crystal Quartz Stuart Crystal Pendant with Profile of Charles I. © Trustees of the British Museum. Rock Crystal can be found in many mourning, memorial, keepsake and sentimental jewelry items throughout the Georgian and Victorian era. 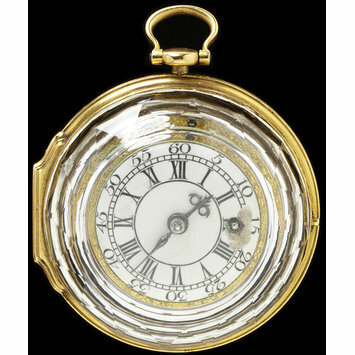 Many watches in the Georgian and Victorian era can be found with rock crystal protective covers. 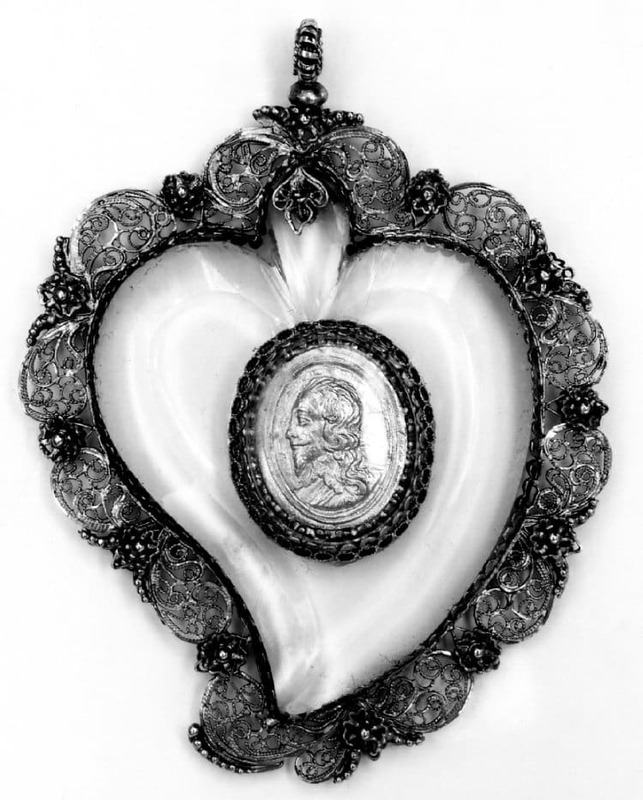 Throughout the Georgian and Victorian eras, rock crystal can be found in many cameos, seals and intaglios. Like any gemstones or paste, rock crystals could be foiled. Foiling increases their sparkle. Foiling was popular especially during the Georgian era. 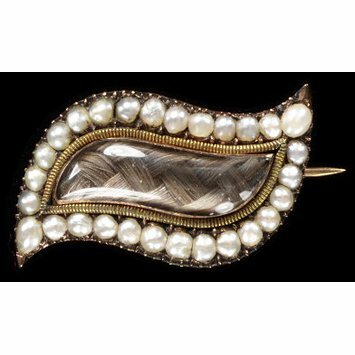 Foiled rock crystals were used in pendants, brooches, bodice ornaments, necklaces, rings, buckles, buttons and earrings. Foiled rock crystal would often be used along side foiled paste. 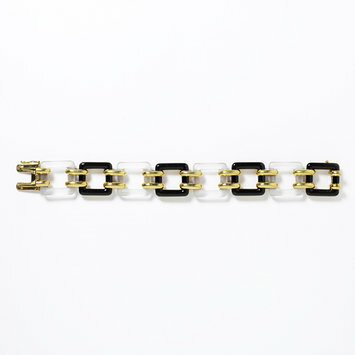 Although rare to find it without other materials, rock crystal can be stunning when used completely by itself, as with this unusual piece below. 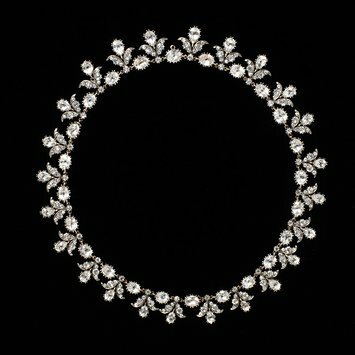 Worn in the Victorian through the Art Deco period, simple real rock crystal bead necklaces were popular. 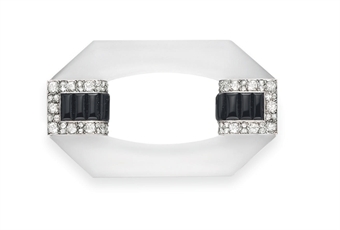 Open backed rock crystal set ring were often cut and set in a similar fashion to diamond rings. 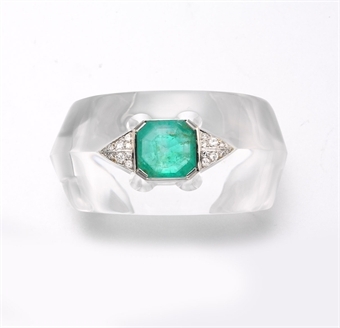 Rock crystal lends itself well with being set in silver and there are many examples. Pendant, rock crystal set in silver. 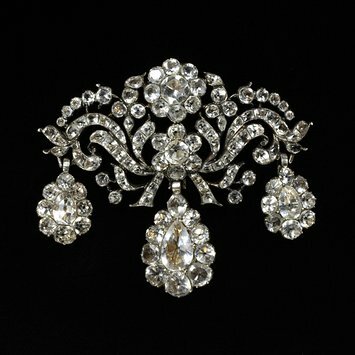 Rock Crystal was popular during the Edwardian / Belle Epoque Era because colorless gems and materials were very much in fashion. 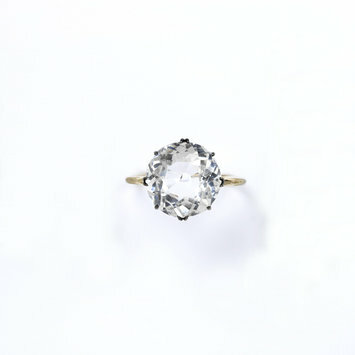 Rock Crystal would often be set with diamonds in platinum. Rock crystal was popular during the Art Deco era, and there are many examples of geometrically carved rock crystal from the time. 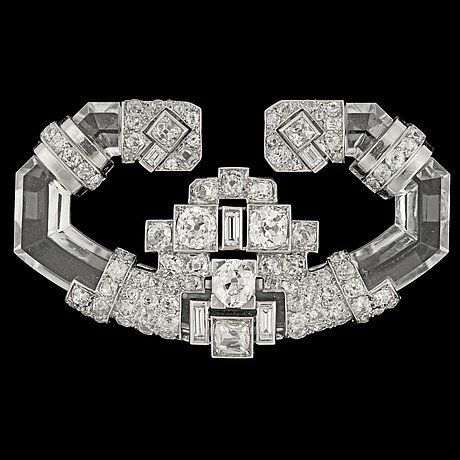 It was valued because it went well with the all clear or white look which became very popular towards the end of the 1920s. 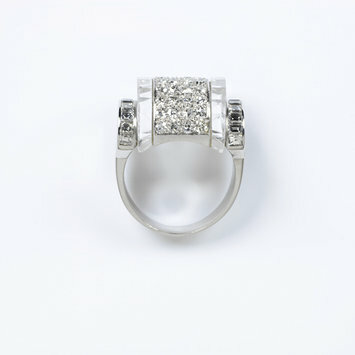 It is common to find rock crystal set with diamonds as well as in platinum. 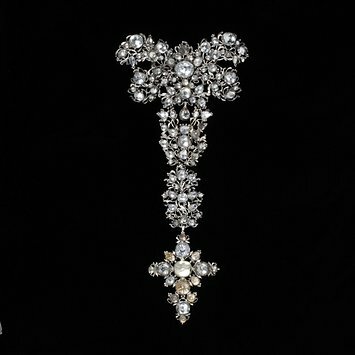 A Mauboussin rock crystal and antique- old- and baguette cut diamond Art Deco brooch c. 1925.